Dates and Venue September 7 - October 6, 2018, 8pm Wed – Sat with 2pm Sat matinees | Pacific Theatre, 1440 W 12th Ave. First-time Toronto playwright Ins Choi developed his single act play from a trial-size version written for the 2011 Toronto Fringe Festival. 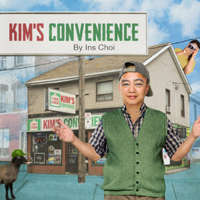 Set in Regent Park, a soon to be gentrified neighbourhood in Toronto, Kim’s Convenience is a clichéd immigrant story that focuses on a loving, though somewhat dysfunctional Korean family presided over by a stereotypical patriarch. This production succeeds in no small part to a stellar performance by James Yi as the central character, Mr. Kim. Kim’s Convenience is certainly entertaining; getting much of its comedy from the titular convenience store owner’s fractured use of the English language and his complicated relationship with his daughter Janet. The drama is served through the damaged relationship with his estranged son Jung. Yi skillfully displays the nuances of a foreign born citizen holding on to traditional values established in his native country while stopping well short of a caricature performance. However, I did find it curious that he speaks to his wife in Korean and to his daughter in English. He keeps his store in near perfect order — as constructed by Carolyn Rapanos’ detailed set of the well-stocked shelves of magazines, candy and comfort snacks that you would expect to find in any convenience store. But Kim’s world is changing quickly. The old neighbourhood surrounding the store is being overtaken by up-market condos, and prospective developers are already knocking on his door. Kim would prefer to hand over the running of the store to the next generation. However, his son Jung has left home as a result of a bitter quarrel and daughter Janet has no interest in working the long hours that running a family store demands. In one of the show’s more absurdly amusing moments, the elder Kim insists on teaching his reluctant daughter how to profile customers who “steal or no-steal" based on race and sexual preference (the play does successfully straddle this fine line between being funny and being offensive). Jessie Liang is charming as the fiercely independent Janet Kim and provides an excellent foil for her father’s bellicose personality. Maki Yi (no relation to James Yi) is tenderly effective as Umma (Korean for Mom) the family matriarch. Tre Cotton acquits himself well in multiple roles; some perhaps more ably than others. Lee Shorten takes on the token role of prodigal son Jung Kim. Director Kaitlin Williams steps away from the stage in this production, wisely allowing the actors to determine the easy pace of the play. Jonathan Kim’s (I’m sure his last name is coincidental) lighting and Chengyan Boon’s sound combine to enhance the overall performance. Despite its predictable and rather saccharine ending, Kim’s Convenience nonetheless manages to achieve its principal goal – sending the audience home with a collective smile on their face.